Siemens and the Ministry of Electricity of the Republic of Iraq have entered a milestone agreement to seek the implementation of the company’s roadmap for repowering Iraq. 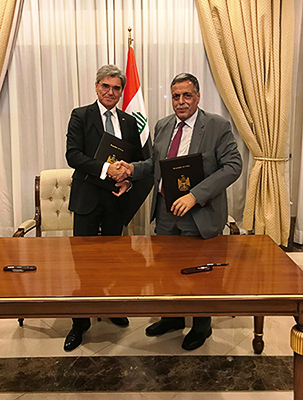 Signed by Qasim Al-Fahdawi, Minister of Electricity, and Joe Kaeser, President and CEO of Siemens AG, the Memorandum of Understanding (MoU) will examine a series of short, medium and long-term plans to meet the reconstruction goals of Iraq and support the country’s economic development. Siemens’ Iraq Roadmap outlines eight objectives to benefit the people of Iraq, the country’s national security and its economic development. These include reducing energy losses, introducing smart grids, strengthening the transmission grid, modernizing existing power plants, adding new generation capacities in deprived areas, connecting Iraq to the Arab Gulf region, putting Iraq’s national resources to work, and investing in its people. Modernizing the country’s energy infrastructure is intended to be completed in stages, from immediate improvement for up to 300,000 people, which can be operational within three months, to medium and long-term projects that require between 10 and 24 months’ completion time and beyond. The company will also assist Iraq’s government in securing appropriate finance packages provided by international commercial banks, Export Credit Agencies and supported by the German Government. The roadmap lays out plans to use Iraq’s valuable natural resources more efficiently by utilizing flare gas capture and treatment technologies to deliver a domestic source of fuel to Iraq’s power generation sector, as well as create a long-term source of revenue for the government to finance power generation, transmission, and distribution projects.